The museum was established initially as a picture gallery in the 1920s but, as a matter of fact, the city government had always been involved in developing its art collections and, since the 16th century, commissioned works by prestigious artists to decorate the town hall and make it more impressive. 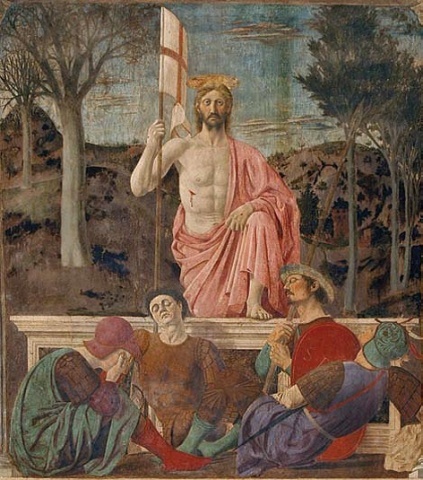 The starting point was, of course, Piero della Francesca’s Resurrection, the city’s emblem and symbol, which was frescoed around 1460 in the Palazzo della Residenza’s Sala dei Conservatori. 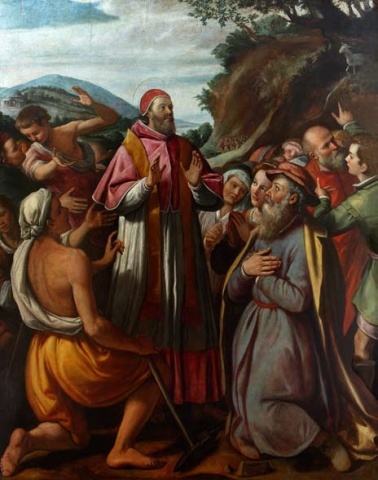 In the second half of the 16th century, the town sent for the famous Venetian painters, the Bassano family – very active in Sansepolcro – to decorate the chapel in the Palazzo della Residenza. In addition, works by Raffaellino del Colle and Leonardo Cungi were acquired. During the 17th century, for a visit by Leopoldo II, the early collection was increased with the transfer of Cherubino Alberti’s famous engravings from the nearby town hall. 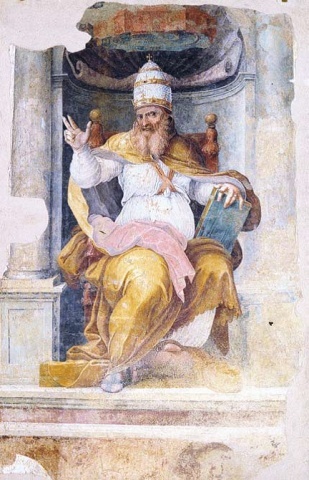 Given these illustrious precedents, it was only natural for the fresco of Saint Louis, detached from the walls of the Palazzo Pretorio, to be placed in these rooms in 1846. Following the Napoleonic and Leopoldine suppressions of religious orders, between the late 18th and the first decade of the 19th century, the museum’s collection began to set itself up as an experimental and general gallery of works of art. The growing desire to preserve and protect the city’s artistic heritage supported the transfer to the Palazzo della Residenza of works that were in “danger of deterioration”. 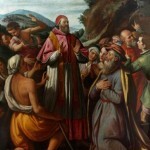 This was especially in reference to the paintings in the Churches of Santa Chiara and of Sant’Agostino as well as the polyptych of Our Lady of Mercy, which became part of the Civic Picture Gallery collections in 1901. 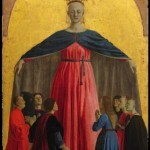 With the new century, a genuine culture of conservation became widespread in Sansepolcro such that at that time the organization of the picture gallery also involved some experts who, simultaneously with the literary success of writings on Piero della Francesca by Roberto Longhi, Mario Salmi, Kenneth Clark, and Rudolf Wittkower, demonstrated a growing interest in the Valtiberina. Over the years, this general enthusiasm was strengthened by the discovery and subsequent transfer of Saint Julian to the museum. Subsequently, the collaboration between the City of Sansepolcro, the Arezzo Superintendency, and the Tuscan region allowed the new museum to be inaugurated in 1975, with expanded exhibition spaces due to the renovation of areas on the top floor and in the basement. It is especially in this celebrated fresco that Piero della Francesca’s art reaches its peak in the perfect synthesis of art and science. 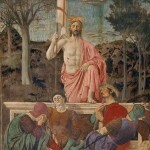 The risen Christ, on which the most eloquent pages of critical literature have been written, becomes in the collective imagery a universal symbol, a cosmic emblem (Kronig, 1959), a metaphor of contemplation and a tangible sign of the eternal. Portrayed facing perfectly forward, he rises powerfully on the sarcophagus and immediately holds a crusader flag firmly in his hand. It is the Christ who triumphs over the darkness of death and over the ignorance of the earthly world and the silence of humankind, yet who, at the same time, marks the passing of seasons and times, of life and death. In the middle of the scene stands Pope Clement I, exiled to Crimea by Emperor Trajan, while preaching to the Christians among the marble excavators. The subject refers to the miraculous episode in which, through the saint’s intercession, a water source flows out of the place indicated by the symbolic Lamb (pictured in the grove on the right), an obvious allegory of Christ. In the painting, with an accentuated horizontal format, the mythological Scylla appears in the foreground drawing back upon the arrival of Glaucus, now transformed into a sea god who has fallen in love with the beautiful nymph. The episode is taken from Ovid’s Metamorphosis, which influenced the arts during Mannerism and the Baroque period, forming a very fruitful repository and primary source of inspiration for the literary, musical, and figurative representation of subjects taken from the myth. 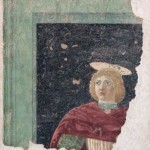 The work, of a mainly public character, was painted by Piero della Francesca in a room of Sansepolcro’s Palazzo Pretorio, to celebrate the Florentine captain Lodovico di Odoardo Acciaioli, commissar in Sansepolcro from 3 July 1460 to 3 January 1461. 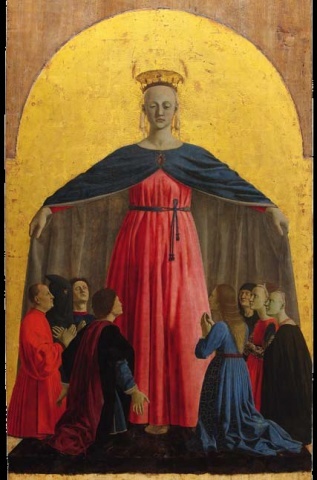 The Misericordia Polyptych, of which this Our Lady of Mercy is part, was commissioned to Piero della Francesca in 1445 by the Confraternity of Mercy. 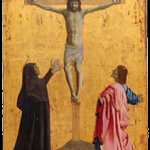 However, the work was not fully completed until the sixth decade of that century (Banker 2010), despite the likely involvement of assistants in the execution of some marginal parts of the polyptych (the predella scenes). There are obvious stylistic, aesthetic as well as technical and executive differences in the individual compartments that confirm that the work was carried out in stages. 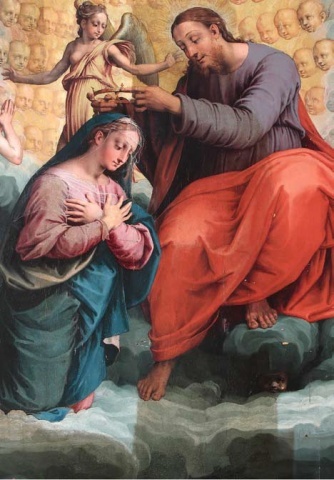 The iconography in which the Assumption and the Coronation are simultaneously depicted was often present in the Observant Minor churches during the 16th century. In Umbria especially, the icons were arranged generally on the high altar, as if to underline their importance to worship and theology. 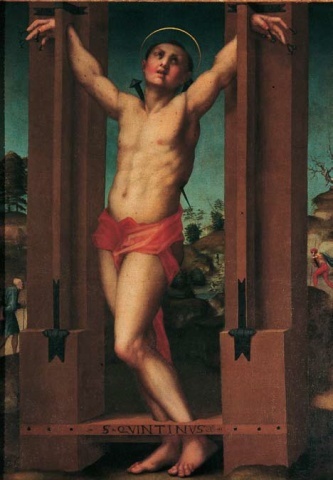 The composition of the Martyrdom of Saint Quentin was influenced primarily by the painting’s liturgical purpose and its placement in a religious building from the beginning. The entire scene is rendered with a style that met the rich local patrons’ requests for devotional images. The rather rare and unusual subject perhaps refers to private worship and, in any case, unusual in the area. 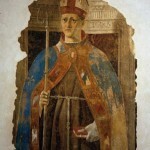 The “theme” of the Saint Julian appears to have been particularly successful during the 15th century evoking the cultural value attributed to the saint, as the protector of pilgrims and the Hospitallers, already in the Middle Ages. 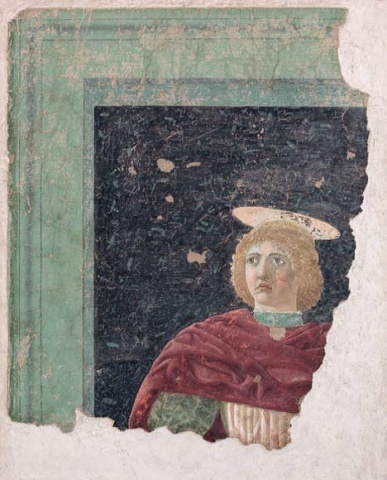 Even if the lower part is mutilated or missing, the young man wears Saint Julian’s “clothes”. 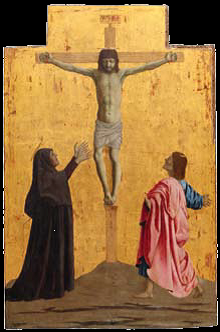 This Crucifixion is part of the top panel of the Misericordia Polyptych commissioned to Piero della Francesca. 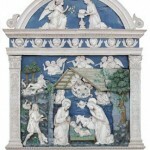 The altarpiece with the Nativity, from the church of Santa Chiara, is referred to Andrea Della Robbia. 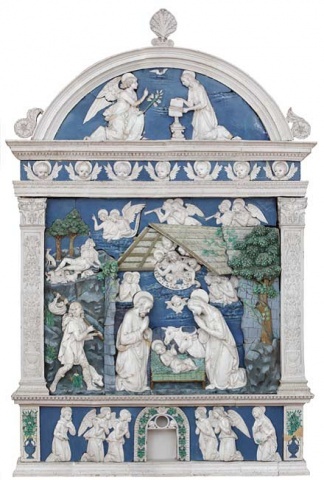 It is an iconographically complex and intricate work, connected to the Della Robbia production from the 1480s. The Nativity with the Announcement to the Shepherds and the Annunciation in the lunette is organized on three registers: at its center is the image of the Nativity scene with shepherds, with the Annunciation above and the Eucharistic Tabernacle Surrounded by Angels and Saints below. The rigorous arrangement and geometry is accentuated by the side pilasters topped by leafy capitals and by a horizontal entablature, consisting of dentil cornices and a central band with cherubs. 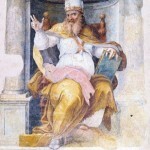 The subject represented is, however, connected to the institution of the bishopric, because it represents Pope Leo the Great, the pontiff who stopped Attila’s army that was heading for Rome. 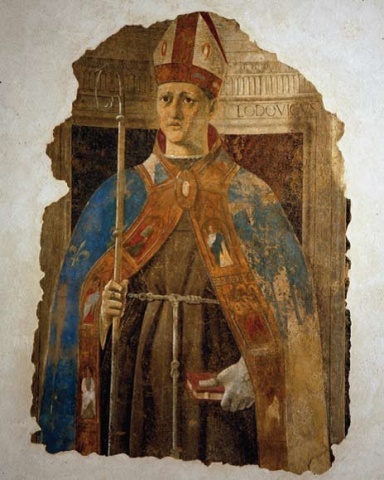 It is a clear and explicit allusion, then, to the events in Sansepolcro’s at that time when the Medici pope intervened in support of the local episcopate. 10.00 a.m. to 1 p.m. / 2.30 p.m. to 6 p.m.
10,00 a.m. to 1.30 p.m. / 2.30 p.m. to 7 p.m. Ticket sales end 20 minutes before closing time. For people with disabilities, the museum is accessible on the ground floor and basement. The tower, however, is not accessible. € 13 each; € 9 for groups with a minimum of 10 people.